How bad’s the cold been this winter? Well, check out these guys standing on the reflecting pool in front of the Capitol. I’m not sure it’s frozen all the way through, but certainly enough to hold up a couple dudes on the Ice. 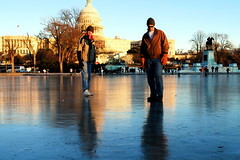 There were several hundred people on the ice right after the Inauguration and it definitely was cracking under my feet. Dudes on Ice…didn’t that show come to the Verizon Center?